The Zodiac Killer was a serial killer who operated in Northern California in the late 1960s. His identity remains unknown. The Zodiac killer coined his name in a series of taunting letters he sent to the press. His letters included four cryptograms (or ciphers), three of which have yet to be solved. The Zodiac murdered five known victims in Benicia, Vallejo, Lake Berryessa, and San Francisco between December 1968 and October 1969. Four men and three women between the ages of 16 and 29 were targeted. Numerous suspects have been named by law enforcement and amateur investigators, but no conclusive evidence has surfaced. In April 2004, the San Francisco Police Department marked the case "inactive" but re-opened it some time before March 2007. The case also remains open in the city of Vallejo as well as in Napa and Solano Counties. The California Department of Justice has maintained an open case file on the Zodiac murders since 1969. * David Arthur Faraday, 17, and Betty Lou Jensen, 16: Shot and killed on December 20, 1968, on Lake Herman Road just within the city limits of Benicia. * Michael Renault Mageau, 19, and Darlene Elizabeth Ferrin, 22: Shot on July 4, 1969, at the Blue Rock Springs Golf Course parking lot on the outskirts of Vallejo. Ferrin was DOA at Kaiser Foundation Hospital, while Mageau survived. * Bryan Calvin Hartnell, 20, and Cecelia Ann Shepard, 22: Stabbed on September 27, 1969 at Lake Berryessa in Napa County. Hartnell survived six stab wounds to the back, but Shepard died of her injuries two days later. * Paul Lee Stine, 29: Shot and killed on October 11, 1969, in Presidio Heights in San Francisco. * Cheri Jo Bates, 18: Stabbed to death and nearly decapitated on October 30, 1966, at Riverside Community College in Riverside. Bates' possible connection to the Zodiac only came to light four years after her murder when San Francisco Chronicle reporter Paul Avery received a tip regarding similarities between the Zodiac killings and the circumstances surrounding Bates' death. * Robert Domingos, 18, and Linda Edwards, 17: Shot and killed on June 4, 1963, at a beach near Lompoc. Edwards and Domingos were named as possible Zodiac victims because of specific similarities between their attack and the Zodiac's attack at Lake Berryessa six years later. * Kathleen Johns, 22: Allegedly abducted on March 22, 1970, on Highway 132 by I-580, west of Modesto. Johns escaped from the car of a man who drove her and her infant daughter around in the area between Stockton and Patterson for some three hours. * Donna Lass, 25: Last seen September 6, 1970, in Stateline, Nevada. A postcard with an ad from Forest Pines condominiums (near Incline Village at Lake Tahoe) pasted on the back was received at the Chronicle on March 22, 1971, and has been interpreted by some as the Zodiac claiming Lass' disappearance as a victim. [unreliable source?] No evidence has been uncovered to connect Donna Lass' disappearance with the Zodiac Killer. The first murders widely attributed to the Zodiac Killer were the shootings of high school students Betty Lou Jensen and David Faraday on December 20, 1968, just inside Benicia city limits. The couple were on their first date and planned to attend a Christmas concert at Hogan High two or three blocks from Jensen's home. Instead, they visited a friend and stopped at a local restaurant, then drove out Lake Herman Road. At about 10:15 p.m. Faraday parked his mother's Rambler in a gravel turnout, which was a well-known lovers' lane. Shortly after 11 p.m., another car pulled into the turnout and parked beside them. The driver apparently got out with a pistol and ordered them out of the Rambler. Jensen exited first. When Faraday was halfway out, the man shot Faraday in the head. Fleeing, Jensen was gunned down twenty-eight feet from the car with five shots through her back. The man then drove off. Some time around midnight on July 4–July 5, 1969, Darlene Ferrin and Michael Mageau drove to the Blue Rock Springs Golf Course in Vallejo, four miles from the Lake Herman Road murder site, and parked. While they sat in Ferrin's car, another car drove into the lot and parked beside them. It drove away almost immediately, then returned about 10 minutes later and parked behind them. The driver then got out and approached the passenger side door, carrying a flashlight and a 9 mm Luger. He first shone the light in their eyes to blind them, then shot both of them 3 times and began to return to his car. When Mageau moaned in pain, the driver returned and shot them both 2 more times. He then drove off. At 12:40 a.m., a man phoned the Vallejo Police Department to report and claim responsibility for the attack. He also took credit for the murders of Jensen and Faraday six-and-a-half months earlier. The police traced the call to a phone booth at a gas station at Springs Road and Tuolumne, about three-tenths of a mile from Ferrin's home and only a few blocks from the Vallejo Police Department. On August 1, 1969, three letters prepared by the killer were received at the Vallejo Times-Herald, the San Francisco Chronicle, and the San Francisco Examiner. The nearly identical letters took credit for the shootings at Lake Herman Road and Blue Rock Springs. Each letter also included one-third of a 408-symbol cryptogram which the killer claimed contained his identity. The killer demanded they be printed on each paper's front page or he would "cruse [sic] around all weekend killing lone people in the night then move on to kill again, until I end up with a dozen people over the weekend." The Chronicle published its third of the cryptogram on page four of the next day's edition. An article printed alongside the code quoted Vallejo Police Chief Jack E. Stiltz as saying "We're not satisfied that the letter was written by the murderer" and requested the writer send a second letter with more facts to prove his identity. The threatened murders did not happen, and all three parts were eventually published. On August 7, 1969, another letter was received at the San Francisco Examiner with the salutation "Dear Editor This is the Zodiac speaking". It was the first time the killer had referred to himself with this name. The letter was in response to Chief Stiltz asking him to provide more details to prove he killed Faraday, Jensen and Ferrin. In it, the Zodiac included details about the murders which had not been released to the public as well as a message to the police that when they cracked his code "they will have me". On September 27, 1969, Bryan Hartnell and Cecelia Shepard were picnicking at Lake Berryessa on a small island connected by a sand spit to Twin Oak Ridge. A man approached them wearing a black executioner's-type hood with clip-on sunglasses over the eye-holes and a bib-like device on his chest that had a white 3"x3" cross-circle symbol on it. He approached them with a gun Hartnell believed to be a .45. The hooded man claimed to be an escaped convict from Deer Lodge, Montana, where he killed a guard and stole a car, and explained that he needed their car and money to go to Mexico. He had brought precut lengths of plastic clothesline and told Shepard to tie up Hartnell, before tying her up himself. The Zodiac checked and tightened Hartnell's bonds after discovering she bound him loosely. Hartnell initially believed it to be a weird robbery, but the man drew a knife and stabbed them both repeatedly. He then hiked 500 yards back up to Knoxville Road, drew the cross-circle symbol on Hartnell's car door with a black felt-tip pen, and wrote beneath it: Vallejo/12-20-68/7-4-69/Sept 27-69-6:30/by knife. At 7:40 p.m., the man called the Napa County Sheriff's office from a pay telephone to report his crime. The phone was found still off the hook minutes later at the Napa Car Wash on Main Street in Napa by KVON radio reporter Pat Stanley, only a few blocks from the sheriff's office and 27 miles from the crime scene. Detectives were able to lift a still-wet palm print from the telephone but were never able to match it to a suspect. A man and his son who were fishing in a nearby cove had discovered the victims after hearing their screams for help and summoned help by contacting park rangers. Napa County Sheriff Deputies Dave Collins and Ray Land were the first law enforcement officers to arrive at the scene of the assault. Cecelia Shepard was conscious when Collins arrived and gave him a detailed description of the attacker. Hartnell and Shepard were taken to Queen of the Valley Hospital in Napa by ambulance. Shepard lapsed into a coma during transport to the hospital and never regained consciousness. She died two days later, but Hartnell survived to recount his tale to the press Napa County Sheriff Detective Ken Narlow, who was assigned to the case from the outset, worked on solving the crime until his retirement from the department in 1987. On October 11, 1969, a man entered Paul Stine's cab at the intersection of Mason and Geary Streets in San Francisco and requested to be taken to Washington and Maple Streets in Presidio Heights. For reasons unknown, Stine drove only one block further to Cherry Street; the passenger then shot Stine once in the head with a 9 mm, took his wallet and car keys, and then tore off his shirt tail. He was observed by three teenagers across the street at 9:55 pm, who called the police as the crime was in progress. They observed the man wiping the cab down, and then walking away towards the Presidio, one block to the north. The police arrived minutes later, and the teen witnesses explained that the killer was still nearby. Two blocks from the crime scene, Officer Don Fouke, also responding to the call, observed a white man walking along the sidewalk, then stepping onto a stairway leading up to the front yard of one of the homes on the north side of the street; the encounter lasted only five to ten seconds. The policeman's partner, Eric Zelms, did not see the man.The radio dispatch had alerted them to look for a black and not a white suspect, so they drove past him without stopping; the mix-up in descriptions remains unexplained to this day. When the officers reached Cherry, Fouke was informed by Officer Pellisetti that they were in fact looking for a white suspect; Fouke realized that they must have passed the killer. Fouke concluded that the Zodiac had resumed his original route and escaped into the Presidio,so they entered the base to look for the killer, but he had vanished. A search ensued, but no one was found. The three teen witnesses worked with a police artist to prepare a composite of Stine's killer, and a few days later returned to produce a second composite. The killer was estimated to be 35–45 years of age. Detectives Bill Armstrong and Dave Toschi were assigned to the case. The San Francisco Police Department eventually investigated an estimated 2,500 suspects over a period of years. On October 14, 1969, the Chronicle received yet another letter from the Zodiac, this time containing a swatch of Paul Stine's shirt tail as proof he was the killer; it also included a threat about shooting school children. It was only then that the police knew whom they were looking for a few nights before in Presidio Heights. At 2 a.m. on October 22, 1969, someone claiming to be the Zodiac called Oakland PD demanding that one of two prominent lawyers, F. Lee Bailey or Melvin Belli, appear on Jim Dunbar's television talk show in the morning. Bailey was not available, but Belli appeared on the show. Dunbar appealed to the viewers to keep the lines open, and eventually, someone claiming to be the Zodiac called several times and said his name was "Sam." Belli agreed to meet with him in Daly City, but the suspect never showed up. Police officers who had heard the Zodiac, listened to "Sam's" voice and agreed that he was not the Zodiac. Subsequent calls the suspect made to Belli were traced to the Napa State Hospital, where it was learned that "Sam" was a psychiatric patient. As she gave her statement to the sergeant on duty, she noticed the police composite of Paul Stine's killer and recognized him as the man who abducted her and her child. Fearing the Zodiac might come back and kill them all, the sergeant had Johns wait in nearby Mil's Restaurant in the dark. When her car was found later, it had been gutted and torched. There are many conflicting accounts of the Johns abduction. Most claim he threatened to kill her and her daughter while driving them around, but at least one police report disputes that. Johns' account to Paul Avery of the Chronicle indicates her abductor left his car and searched for her in the dark with a flashlight; however, in one report she made to the police, she stated he did not leave the vehicle. Some accounts state Johns' vehicle was moved, then torched, while others contend it was located where she'd left it. [The various discrepancies among Johns' accounts over the years have led many researchers to question whether she was an actual Zodiac victim. On November 8, 1969, the Zodiac mailed a card with another cryptogram consisting of 340 characters. On November 9, 1969, he mailed a seven-page letter in which he claimed that two policemen stopped and actually spoke with him three minutes after he shot Stine. Excerpts from the letter were published in the Chronicle on November 12, including the Zodiac's claim; that same day, Don Fouke wrote a memo explaining what had happened that night. The 340-character cipher has never been decoded. Many possible "solutions" have been suggested, but cannot be accepted since they do away with code-making conventions. On December 20, 1969, exactly one year after the murders of David Faraday and Betty Lou Jensen, the Zodiac mailed a letter to Belli and included yet another swatch of Stine's shirt; the Zodiac claimed he wanted Belli to help him. The Zodiac continued to communicate with authorities for the remainder of 1970 via letters and greeting cards to the press. In a letter postmarked April 20, 1970, the Zodiac wrote, "My name is _____", followed by a 13-character cipher. 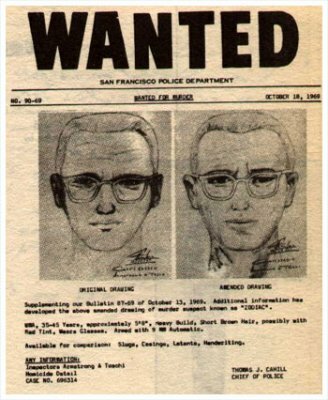 The Zodiac went on to state that he was not responsible for the recent bombing of a police station in San Francisco (referring to the February 18, 1970, death of Sgt. Brian McDonnell two days after the bombing at Park Station in Golden Gate Park) but added "there is more glory to killing a cop than a cid [sic] because a cop can shoot back." The letter included a diagram of a bomb the Zodiac claimed he would use to blow up a school bus. At the bottom of the diagram, he wrote: "Zodiac-logo crop.jpg = 10, SFPD = 0". Zodiac sent a greeting card postmarked April 28, 1970, to the Chronicle. Written on the card was, "I hope you enjoy yourselves when I have my BLAST", followed by the Zodiac's cross circle signature. On the back of the card, the Zodiac threatened to use his bus bomb soon unless the newspaper published the full details he wrote. He also wanted to start seeing people wearing "some nice Zodiac butons [sic]". In a letter postmarked June 26, 1970, the Zodiac stated he was upset that he did not see people wearing Zodiac buttons. He wrote, "I shot a man sitting in a parked car with a .38." It has been proposed the Zodiac was referring to the murder of Sgt. Richard Radetich a week earlier, on June 19. At 5:25 AM, Radetich was writing a parking ticket in his squad car when an assailant shot him in the head with a .38-caliber pistol. Radetich died 15 hours later. SFPD denies the Zodiac was involved in this murder; it remains unsolved. Included with the letter was a Phillips 66 map of the San Francisco Bay Area. On the image of Mount Diablo, the Zodiac had drawn a crossed-circle similar to the ones he had included in previous correspondence. At the top of the crossed circle, he placed a zero, and then a three, six, and a nine, so the annotation resembled a clock face. The accompanying instructions stated that the zero was "to be set to Mag. N." The letter also included a 32-letter cipher that the killer claimed would, in conjunction with the code, lead to the location of a bomb he had buried and set to go off in the autumn. The bomb was never located. The killer had signed the note with "Zodiac-logo crop.jpg = 12, SFPD = 0." In a letter to the Chronicle postmarked July 24, 1970, the Zodiac took credit for Kathleen Johns' abduction, four months after the incident. In his July 26, 1970 letter, the Zodiac paraphrased a song from The Mikado, adding his own lyrics about making a "little list" of the ways he planned to torture his "slaves" in "paradice." The letter was signed with a large, exaggerated cross circle symbol and a new score: "Zodiac-logo crop.jpg = 13, SFPD = 0." A final note at the bottom of the letter stated, "P.S. The Mt. Diablo code concerns Radians + # inches along the radians." In 1981, a close examination of the radian hint by Zodiac researcher Gareth Penn led to the discovery that a radian angle, when placed over the map per Zodiac's instructions, pointed to the locations of two Zodiac attacks. On October 27, 1970, Chronicle reporter Paul Avery (who had been covering the Zodiac case) received a Halloween card signed with a letter 'Z' and the Zodiac's cross circle symbol. Handwritten on the card was the note "Peek-a-boo, you are doomed". The threat was taken seriously and received a front-page story on the Chronicle. Soon after, Avery received an anonymous letter alerting him to the similarities between the Zodiac's activities and the unsolved murder of Cheri Jo Bates, which had occurred four years earlier at the city college in Riverside in the Greater Los Angeles Area, more than 400 miles south of San Francisco. He reported his findings in the Chronicle on November 16, 1970. On October 30, 1966, 18-year-old Bates spent the evening at the campus library annex until it closed at 9 p.m. Neighbors reported they heard a scream around 10:30 p.m. Bates was found dead the next morning a short distance from the library between two abandoned houses slated to be demolished for campus renovations. The wires in her Volkswagen's distributor cap had been pulled out. She was brutally beaten and stabbed to death. A man's Timex watch with a torn wristband was found nearby. The watch had stopped at 12:24,but police believe the attack occurred much earlier.The police also discovered the prints of a military-style shoe. A month later, on November 29, 1966, nearly identical typewritten letters were mailed to the Riverside police and the Riverside Press-Enterprise, titled "The Confession". The author claimed responsibility for the Bates murder, providing details of the crime not released to the public. The author warned that Bates "is not the first and she will not be the last". In December 1966, a poem was discovered carved into the bottom side of a desktop in the Riverside Community College library. Titled "Sick of living/unwilling to die", the poem's language and handwriting resembled those of the Zodiac's letters. It was signed with what were assumed to be the initials, "rh". Sherwood Morrill, California's top "Questioned Documents" examiner, expressed his opinion that the poem was written by the Zodiac. On April 30, 1967, the six-month anniversary of Bates' murder, Bates' father Joseph, the Press-Enterprise, and the Riverside police all received nearly identical letters. In handwritten scrawl, the Press-Enterprise and police copies read, "Bates had to die there will be more", with a small scribble at the bottom that resembled the letter 'Z'. Joseph Bates' copy read "She had to die there will be more" without a 'Z' signature. On March 13, 1971, nearly four months after Paul Avery's first article on Bates, the Zodiac mailed a letter to the Los Angeles Times. In it, he credited the police instead of Avery for discovering his "Riverside activity, but they are only finding the easy ones, there are a hell of a lot more down there". On March 22, 1971, a postcard to the Chronicle addressed to "Paul Averly"—intended for Paul Avery and believed to be from the Zodiac—appeared to take credit for the disappearance of Donna Lass on September 6, 1970. Made from a collage of advertisements and magazine lettering, it featured a scene from an ad for Forest Pines condominiums and the text "Sierra Club," "Sought Victim 12," "peek through the pines," "pass Lake Tahoe areas," and "around in the snow." Zodiac's cross circle symbol was in the place of the usual return address. Lass was a nurse at the Sahara Tahoe hotel and casino. She worked until about 2 a.m. on September 6, treating her last patient at 1:40 a.m., and was not seen leaving her office. The next morning, her work uniform and shoes were found in a paper bag in her office, inexplicably soiled with dirt.Her car was found at her apartment complex, and her apartment was spotless.Later that day both her employer and her landlord received phone calls from an unknown male who falsely claimed Lass had to leave town due to a family emergency.The police and sheriff's office initially treated Lass' disappearance as a missing persons investigation, suspecting she simply left on her own. Lass was never found. What appeared to be a grave site was discovered near the Claire Tappan Lodge in Norden, California, on Sierra Club property, but an excavation yielded only a pair of sunglasses. In a Vallejo Times-Herald story that appeared on November 13, 1972, Santa Barbara Sheriff's Detective Bill Baker (ret.) theorised that the murders of a young couple in Santa Barbara County may have been the work of the Zodiac. After the "Pines" card, the Zodiac remained silent for nearly three years, after which the Chronicle received a letter from the Zodiac, postmarked January 29, 1974, praising The Exorcist as "the best saterical comidy " that he had ever seen. The letter included a snippet of verse from The Mikado and an unusual symbol at the bottom that has remained unexplained by researchers. Zodiac concluded the letter with a new score, "Me = 37, SFPD = 0"
The Chronicle received another letter postmarked February 14, 1974, informing the editor that the initials for the Symbionese Liberation Army spelled out an Old Norse word meaning "kill" However, the handwriting was not authenticated as the Zodiac's. Another letter to the Chronicle, postmarked May 8, 1974, featured a complaint that the movie Badlands was "murder-glorification" and asked the paper to cut its advertisements. Signed only "A citizen", the handwriting, tone, and surface irony were all similar to prior Zodiac communications. The Chronicle received an anonymous letter postmarked July 8, 1974, complaining about one of its columnists, Marco Spinelli. The letter was signed "the Red Phantom (red with rage)". The Zodiac's authorship of this letter is debated. Another four years passed without communication (purported or verified) from the Zodiac. A letter of April 24, 1978, was initially deemed authentic, but was declared a hoax less than three months later by three experts. In recent years, however, the letter has been deemed in some quarters as authentic.Toschi, the SFPD homicide detective who had been on the case since the Stine murder, was thought to have forged the letter, since author Armistead Maupin thought it similar to "fan mail" he received in 1976 that he believed was authored by Toschi. While he admitted writing the fan mail, Toschi denied forging the Zodiac letter and was eventually cleared of any charges. The authenticity of the letter remains in question. On March 3, 2007, it was reported that an American Greetings Christmas card sent to the Chronicle postmarked 1990 in Eureka had been recently discovered in their photo files by editorial assistant Daniel King. Inside the envelope with the card was a photocopy of two U.S. Postal keys on a magnet keychain. The handwriting on the envelope resembles Zodiac's print, but was declared inauthentic by forensic document examiner Lloyd Cunningham. Not all Zodiac experts, however, agree with Cunningham's analysis. [dead link] There is no return address on the envelope nor is his crossed-circle signature to be found. The card itself is unmarked.The Chronicle turned over all the material to the Vallejo Police Department for further analysis. In 2002 SFPD submitted DNA evidence from Zodiac's letters for analysis, which resulted in a partial genetic profile. The test seems to have conclusively ruled out their lead suspect, Arthur Leigh Allen. In April 2004, the SFPD marked the case "inactive", citing caseload pressure and resource demands.They reopened the case some time before March 2007and returned evidence to Vallejo police for additional DNA testing, where the case has remained open. The Zodiac Killer's crimes, letters, and cryptograms to police and newspapers inspired many movies, novels, television productions, and more.